Throughout his entire teaching ministry, Joel Goldsmith taught the spiritual principle that God is expressed as individual consciousness, "as your consciousness and mine." Often he used the scriptural quote: "The place where thou standest is holy ground" to emphasize this principle. As Goldsmith says in I Stand on Holy Ground, "There is but one God, and that God is within you. He is with you if you mount up to heaven; He is with you if you make your bed in hell; He is with you if you walk through the valley of the shadow of death. God will function in your experience in the moment of your recognition of Him." 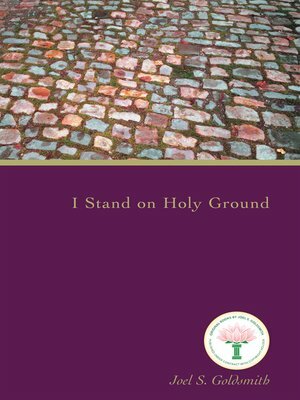 In I Stand on Holy Ground, Goldsmith brings the reader to a profound understanding of how to live a spiritual, contemplative life, consciously aware of the presence of God within and constantly recognizing the key mystical truth: "I and the Father are one." He shows the practicality of abiding in this truth, as when he says: "Where the threat of danger lurks, you will find your security by carrying with you the realization that the place where you stand is holy ground and that no danger of any kind can come near your dwelling place, which is your consciousness." Yet Goldsmith is careful to point out that it is not because God is omnipresent that you are safe, but 'because of your conscious realization, recognition, and acknowledgment of God's presence."